I am often asked which is better - wind turbines, or solar modules. The answer, of course, is that it isn't as simple as stating which technology is better - both have their benefits and drawbacks and which technology is best depends very much on the application and the location of the system. For large scale applications - such as for commercial scale power production for the national grid - wind turbines are the most obvious solution. Large scale wind turbines are efficient and effective, and can be installed in a variety of locations - including far out to sea - comparatively quickly. Unlike the early large turbines, modern turbines are virtually silent and the largest systems can generate in the region of 2 megawatts of power - enough to power over 2,000 homes. On smaller scale systems, turbines can be a good alternative to solar power, but more often than not achieve their best when implemented together with a solar system: a small wind turbine can generate electricity in a breeze even when the sun is not shining, whilst the solar modules can generate electricity during the daytime when the wind is not blowing. Small wind turbines do have disadvantages however, and are very site specific. Compared to large turbines used by the power companies, small wind turbines are not particularly efficient and need to be situated in an area of above average wind in order to generate reasonable amounts of power. They also require a very smooth airflow: the smaller turbines are very susceptible to turbulence - so if you live near to a busy road, or near trees, or in a built up area, a wind turbine is unlikely to work well for you. Turbulent air - where the wind is constantly changing direction - leaves the turbines constantly changing direction, constantly chasing the wind rather than extracting power from it. The UK DIY chain, B&Q, found this to their cost when they started selling their own 1kW turbine system in 2006. Eager customers lined up to buy the competitively priced systems only to find that they did not provide the power advertised. 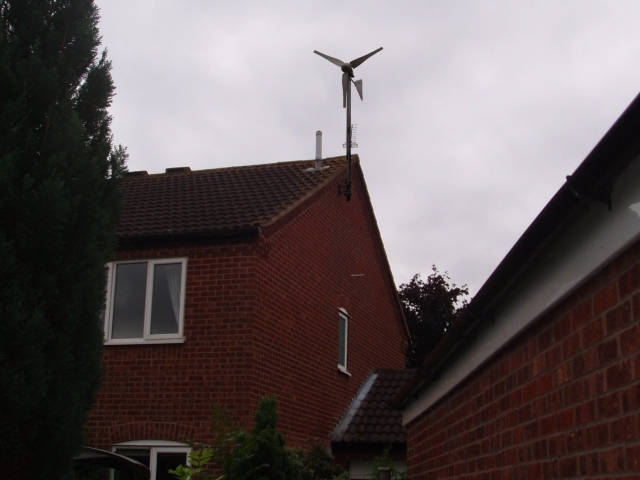 More often than not, the turbines were installed in inappropriate locations - on the sides of houses, in built up areas, and not high enough to catch the breeze. As a consequence, B&Q withdrew the turbines from sale in early 2009. An example of a less-than-ideal turbine installation: here a turbine has been installed in a built up area, close to tall trees and too close to the roof of the house. The turbine will be adversely affected from turbulance from the trees that are too close to the turbine and from up-winds from the roof. The problem is not with the wind turbine itself, but the unsuitable location in which it has been installed. Wind turbines work best near the coast, or in open exposed areas where average wind speeds are high. Ideally, turbines should be mounted high up - even small turbines are often mounted 8-10 meters high in order to get sufficient wind power - and away from buildings. Roof mounting a turbine is not ideal as the building itself generates turbulence, and the vibrations from a turbine being affected by turbulent air can be magnified through brick walls, creating a loud and annoying vibrating sound. All this means substantial foundations and framework for a turbine which can add significant cost to a project. This height can also cause problems if you are planning to mount a system close to neighbouring properties. If you are planning to install a small turbine in combination with a solar electric system, a smaller turbine that generates a few watts of power at lower wind speeds is usually better than a large turbine that generates lots of power at high wind speeds. 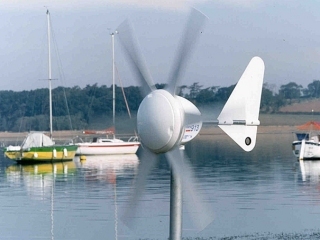 Small wind turbines can often be found on small leisure boats - the turbine maintains the batteries whilst the boats are not in use. Boat owners have mixed reports on their benefits: those who have the turbines mounted relatively low down on the boat find they do not perform well at all - especially in busy marinas where there are lots of boats around. Those who have the turbines mounted high up on a mast report much better performance from their wind turbines. Vitally important when installing a turbine system is the site survey. Accurately measuring wind speeds at different locations throughout your site will ensure you get the optimum performance for your system. The best way to do this is using a professional wind power predictor tool that measures wind speed and turbulence and allows you to predict the amount of power you can generate using wind power. A good example of a suitable tool is the Solar and Wind Power Predictor system available from Maplin Electronics: (http://www.maplin.co.uk/Module.aspx?ModuleNo=266979&C=AffilWin76253). There are a number of wind turbine manufacturers around. Unfortunately, a lot of the cheaper turbines - such as the type found for sale on eBay - are quite often extremely heavy and have poor low-wind performance. The best turbines will typically start spinning in a 5km/h breeze and will start generating electricity at around 8km/h (5mph) whilst a lot of second-rate models won't start generating electricity until they get a 20km/h (12mph) wind. The additional weight of these cheap turbines mean you have to have significantly stronger mountings and the extra cost of this will often outweigh the cost savings made by buying a cheap turbine as opposed to a good one. Wind turbines are an area where buying cheap is almost always a false economy. Buying a good make, such as Rutland, Wren or Coemi will save you money and ensure you have a reliable system in the long run. Compared to solar, turbines are extremely location sensitive. Whereas most people can implement a small solar array in most locations and achieve success, the same cannot be said about turbines. Find the right site, and a turbine can be unbeatable. Find the wrong site, and they can be a complete waste of money and time.